The unsolved homicide of Luella Blakeslee. Luella Blakeslee was last seen alive on July 4, 1969. 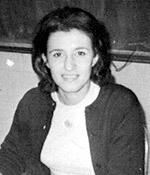 She was a twenty-nine-year-old school teacher who lived in Hooksett, NH at the time of her disappearance. Her skeletal remains were found on May 9, 1998 in Hopkinton, NH. The medical examiner ruled her death as "homicidal violence of an undetermined type." When Luella's remains were identified, the Attorney General's Office issued a news release noting that at the time of her disappearance, suspicion focused on one of her acquaintances, Robert G. Breest, who was subsequently convicted of first-degree murder for the death of Susan Randall. The Attorney General's Office noted that Breest remains a suspect in Luella's death. Breest is currently incarcerated in Massachusetts for Randall's murder.